A violinist, performing both solo and in chamber ensembles, and a teacher of violin. A laureate of music competitions, recognised as one of the most prominent Polish professors of music. He remains attached to the city of Poznan, where he was born and studied violin with Prof. Jadwiga Kaliszewska at the I.J. Paderewski Academy of Music, graduating with honours in 1985. He perfected his violin skills with Andre Gertler. A recognised chamber musician – member of the Collegium Musicorum Posnaniensium Early Music Ensemble for ten years. For 24 years he performed with one of the best orchestras in Europe, the Chamber Orchestra of the Polish Radio “Amadeus”, conducted by Agnieszka Duczmal. Prof. Marcin Baranowski participated in a large number of recording projects and toured nearly the whole world giving concerts in the majority of European countries and in the USA, Canada, Mexico, Brazil, Japan, Kuwait and Taiwan. 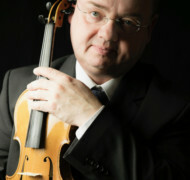 Marcin Baranowski is a professor at schools of music in Poznan and Bydgoszcz. In 1992 he started teaching at the elite Music School in Poznan, the so called “Talents’ School”, contributing to the success of the Polish school of violin by working with the most promising youth. Prof. Marcin Baranowski leads a number of master classes in Poland and abroad (Lancut, Busko-Zdroj, Zagan, Przemysl, Zakopane Art Academy, Pulawy, Zychlin, Kozlowka, Lublin, Bern, Hannover, Graz, Rostock, Spring Time Malkocin, Fuzhow -China, Beijing – China, Bayerische Musikakademie Hammelburg – Germany, The European Krzysztof Penderecki Center for Music in Luslawice, Calisia Music Center Warsaw). He regularly receives invitations to be a jury member at competitions for violinists and violinmakers at home and around the world. His students perform in renowned radio studios and concert halls. Some of them have become concertmasters of the most famous orchestras in Poland and other countries. Many (Anna Maria Staskiewicz, Dominika Falger, Anna Reszniak, Bartosz Woroch, Joanna Kreft, Maxima Sitarz, Aleksandra Januszajtis, Aleksandra Bryla, Lena Zeliszewska, Linda Jankowska, Adam Siebers, Stanislaw Podemski, Anna Malesza, Marta Grygier, Agata Doszczak, Piore Kosarga, Paulina Marcisz, Katarzyna Szydlowska, Katarzyna Hejnowicz, Malgorzata Pasierbska, Zofia Olesik) have won prizes at prestigious violin competitions in Poland and abroad: the Henryk Wieniawski Competition in Poznan and Lublin, the Karol Szymanowski Competition in Lodz, the Z. Jahnke Competition in Poznan, the St. Serwaczynski Competition in Lublin, The International Competition in Torun, the Tibor Varga Competition in Sion, the Competition in Kloster Schontal, the L. Spohr Competition in Weimar, Rahn Musikpreis in Zurich, the Pablo Sarasate Competition in Pamplona, the J. Joachim Competition in Hannover, the Michael Hill Competition in Auckland, Young Concert Artist Trust in London, Andrea Postacchini International Violin Competition in Fermo, Aram Khachaturian International Competition in Yerevan and Zielona Gora Violin Competition. For his outstanding achievement he received the Prize of the Polish Ministry of Culture and National Heritage twice, the Cross of Merit, the Medal of the National Education Committee, and the Gloria Artis Medal.